Obama insisted that nothing less than American democracy — and Florida’s eroding shorelines — are on the line in Tuesday’s election. MIAMI — He never mentioned him by name, but former President Barack Obama made it clear Friday at a rally in Miami's Overtown that by electing Andrew Gillum governor of Florida, the state can deliver a blow to President Donald Trump. Days away from an election that could complicate his successor's chances at re-election or make it easier for him to win a second term, Obama insisted that nothing less than American democracy — and Florida's eroding shorelines — are on the line in Tuesday's election. "I'm hopeful that we will cut through the lies, block out the noise and remember who we are called to be," Obama said at a raucous rally at the Ice Palace, where he was interrupted by protestors several times, asking them at one point: "Why is that folks who won the last election are so mad all the time?" Obama decried Trump's immigration and healthcare policies and warned against "a politics based on division," saying Tuesday's election gives voters an opportunity to embrace a "politics based on a sense we are all in this together. "One election won't eliminate racism or sexism or homophobia .. but it will be a start," Obama said. "And when you start down that path momentum starts to build." He called Tuesday's contest the "most important election of our lifetime" and insisted it wasn't political hyperbole. "The consequences of any of us staying home really are more dangerous," he said. "Maybe most of all the character of our country is on the ballot." The country's first African-American president delivered a robust endorsement for Gillum, who could be the state's first African-American governor. And he called Gillum, who has attracted a nationwide following, "one of the most inspiring, gifted candidates that are running this year" and urged the crowd to "make history happen." But much of his remarks served as a defense of his own two terms and a repudiation of Trump and congressional Republicans: He accused the GOP of spending eight years trying to tear down his signature healthcare law and now pretending to be "Mother Theresa" by promising to cover pre-existing medical conditions. Gillum's opponent, former Rep. Ron DeSantis, Obama charged, "voted to sabotage or repeal the protections every chance he got." And Obama tore into Trump's administration, noting he came to Washington promising to "drain the swamp" but that Trump allies have racked up enough indictments "to fill a football team." He also denounced Trump's closing argument that Democrats are weak on immigration and that a caravan of Central American refugees is a threat to the country, saying it was "designed to make us angry and make us fearful. It's designed to exploit our history of racial and ethnic and religion to pit us against each other." The appearance in Miami by the first African-American president in the country comes as the race has been mired in racial politics. Gillum and his surrogates have accused DeSantis and Trump of flashing the race card to undermine his candidacy. "We have an opportunity to send both Mr. DeSantis and Mr. Trump a message on Nov. 6," Gillum said. "We have a chance to send them an unapologetic message: that their brand of politics is no longer acceptable in the state of Florida." 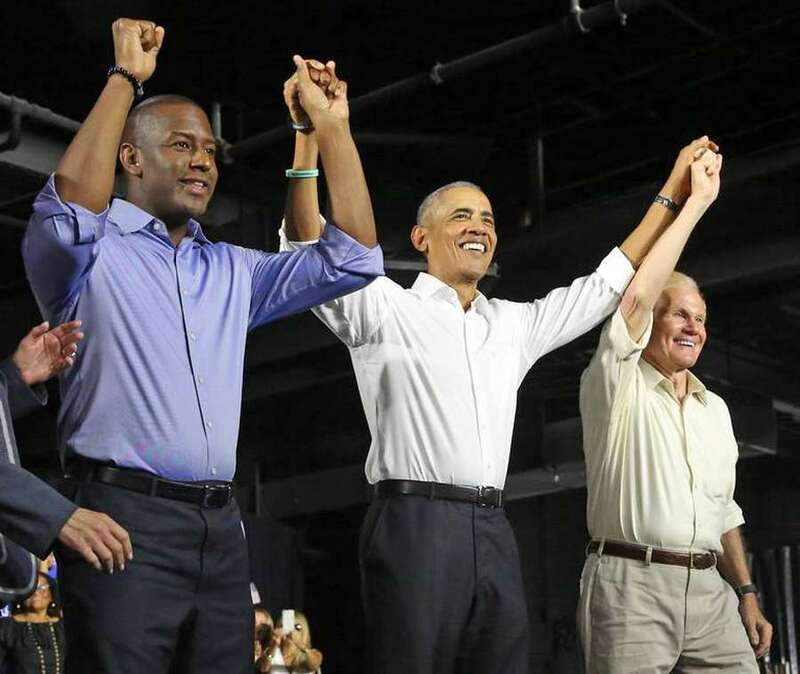 Gillum has invoked Obama to argue that Florida has already answered the question of whether it's ready to elect a black governor: Florida voters twice delivered the state to Obama. Yet mercurial Florida voters handed the state to Trump in 2016, despite Obama urging Florida voters in a November 2016 speech in Miami to back Democratic nominee Hillary Clinton, warning then that "all the progress we've made goes out the window if we don't win this election." On Friday, the faithful jammed into a sweltering, cavernous room at Miami's Ice Palace Films Studios, several attendees wearing Obama T-shirts they said dated to his first run for the presidency in 2008. Gillum's campaign said more than 4,000 people attended. Audience members said they were eager to send a message to Trump: "It's just time for change. The political world has gotten very ugly," said Diamond Williams, 36, an academic advisor at Broward College. "I'm tired of the current situation." Shavon Etan, 39, of Fort Lauderdale, arrived Friday morning to secure a spot at the rally and said she's ready "to make a change." She said it would be "historic for Gillum to win" and she backs his focus on access to healthcare. Before the top of the ticket appeared on stage, Debbie Mucarsel-Powell, Mary Barzee Flores and Donna Shalala, all of whom are seeking to flip three Miami-area Republican-held congressional seats, took turns bashing Trump. "Is Donald Trump an American? Someone should check his birth certificate," Shalala said, charging that Trump's anti-immigration stance represents everything that America is not. Barzee Flores got a round of applause when she noted that Obama had nominated her for a federal judgeship — and Republican Sen. Marco Rubio had blocked him. "The former president believes politics ought to be about honesty and integrity," said Sen. Bill Nelson, the Democrat who is locked in a tight re-election battle with Florida Gov. Rick Scott. "I believe that public office is a public trust." Obama urged voters to return Nelson to office, warning that the Senate fell just one vote shy of repealing the Affordable Health Care Act in 2017 and that "my friend" Nelson would be critical to blocking them. Unlike some of his predecessors who largely sat out of campaigning against their successors, Obama has made it clear he believes he needs to speak out. Obama told a crowd at his first campaign appearance in Chicago in September that he had been "intent on following a wise American tradition of ex-presidents gracefully exiting the political stage and making room for new voices and new ideas." But, he added, "this is one of those pivotal moment when every one of us, as citizens of the United States, need to determine just who it is that we are, just what it is that we stand for." The former president's visit came just two days after Trump campaigned for DeSantis and Scott on Florida's west coast — and a day before Trump returns to the state to campaign for "Rick and Ron" — as Trump dubbed the two Republicans. 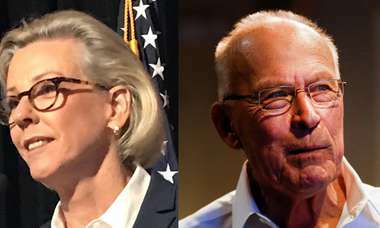 The dueling presidential visits served to underscore the national implications in the state election: Trump's 2020 re-election campaign would be greatly aided by a Republican governor in Tallahassee. And Democrats' efforts to oust Trump in 2020 would be helped by having a Democrat in the governor's mansion in the largest swing state in the country. Millions of Floridians have already cast ballots, but each of the presidential visits are aimed at boosting the party base: Trump campaigned in Southwest Florida on Wednesday and will hold a rally in the Panhandle Saturday, two reliably red areas. Obama appeared in Miami, the state's largest media market, and in a region that is heavily Democratic but comprised largely of Hispanic voters, who traditionally turn out in lower numbers in midterm elections. After his Miami visit, Obama was scheduled to attend an Atlanta rally for Georgia Democratic gubernatorial nominee Stacey Abrams, who, like Gillum, is seeking history: if she wins, she'd be the first black woman to be elected governor in the country. Trump will campaign Sunday in Macon for Abrams' rival, Republican gubernatorial candidate Brian Kemp. He's already trying out lines of attack, telling reporters at the White House, without offering any evidence, that the Yale Law School graduate and former minority leader of the Georgia House of Representatives is "not qualified" to be governor. For all the new dynamics in this Florida election, at least one Florida politics trait remains constant. It looks like another photo finish. This story was written by Lesley Clark.